A young man finds himself possibly dead and wrangling with some of life’s most eternal questions. It’s a good thing he runs into Death, who sets him on a path to track down their own demon offspring. His prophetic guides in this quest are none other than the otherworldly KISS – The Starchild, The Demon, The Spaceman and The Catman. Their help will be needed, with plenty of peril along the way. Writer Amy Chu (Red Sonja, Poison Ivy) returns to the franchise that she helped Dynamite launch with the breakout hit 2016 ongoing series. Joining her is electrifying artist Edu Menna (Twilight Zone, ZNation) and letterer Troy Peteri (Amazing Spider-Man, Witchblade)! Fans have a choice between multiple show stopping covers. Stuart Sayger (Vampirella vs. Reanimator) returns following his jaw-dropping pieces for Bryan Edward Hill’sKISS: Blood and Stardust. Joining him is recent rising star Jorge Fornés (Batman, Magnus). Denis Medri (Red Hood/Arsenal) rounds out this setlist of cover artists. 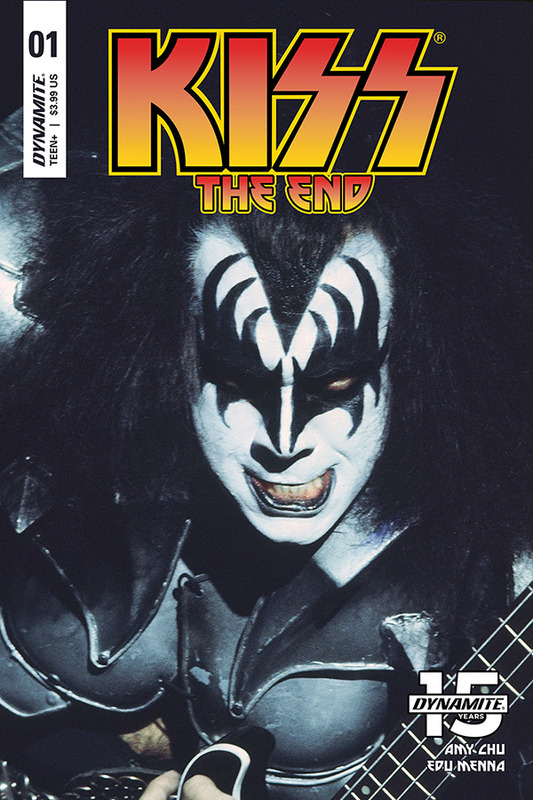 Plus of course a fourth option of classic KISS photos from their incredible library! “A lot of books have rock and a lot of books have roll, but none of them are going to combine the two like we are with this one. This is the first comic that is going to make your ears ring,” said editor Kevin Ketner. 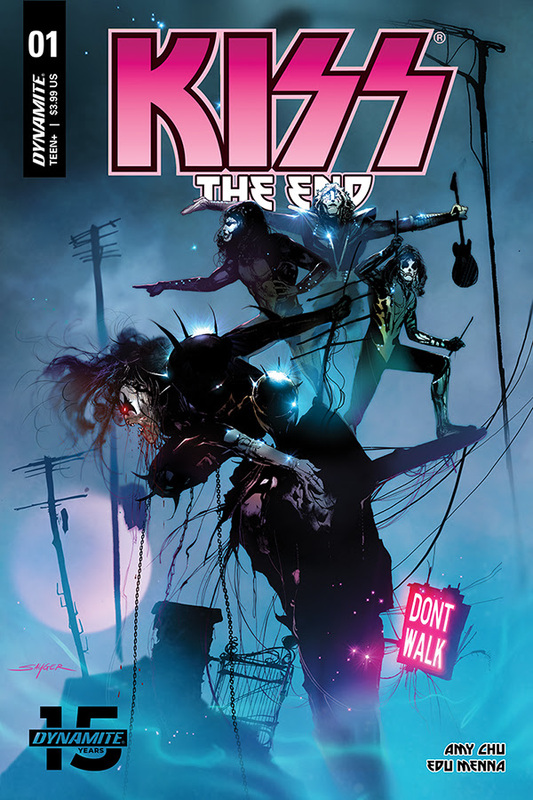 “So go hydrate, do some stretches, and get your LCS to pre-order your copy.” KISS: The End #1 will be solicited in Diamond Comic Distributors’ February 2019 Previews catalog, the premier source of merchandise for the comic book specialty market, and slated for release in April 2019. Comic book fans are encouraged to preorder copies of the issue with their local comic book retailers. It will also be available for individual customer purchase through digital platforms courtesy of Comixology, Kindle, iBooks, Google Play, Dynamite Digital, ComicsPlus, and more!